We have recently partnered with Skydive Mossel Bay and have created the most thrilling wine experience ever! Get the adrenaline pumping, jumping out of a plane at 10 000 feet and free-falling at 200 to 290 km/h for up to 40 seconds. Then ease back into a relaxing mood on the ReedValley wine farm enjoying our range of exclusive export wine and authentic Portuguese dishes. We will introduce you to fabulous wine, delicious food, and not to mention the spectacular scenery that you will experience during your flight over the Mossel Bay area which includes views of the Indian Ocean, Outeniqua Mountains and our famous blue flag beaches. ReedValley is the only wine farm in the Garden Route to offer this unique adventure and we strongly suggest that you add it to your list of top 10 things to do when visiting Mossel Bay. 1) Book your spot online at Skydive Mossel Bay. You can also book by calling 082 824 8599 or emailing info@skydivemosselbay.com. Find any extra information that you might need regarding how long the jump takes, what to wear, what you need to bring, etc. here. 2) For the jump, you will depart from Mossel Bay airfield. 3) We have prepared a safe landing area on the ReedValley farm. During the 5 to 7-minute descent your instructor will provide either a sedate gentle ride to the ground or a more radical roller coaster experience demonstrating spins and stalls as he skillfully takes you to the landing area. 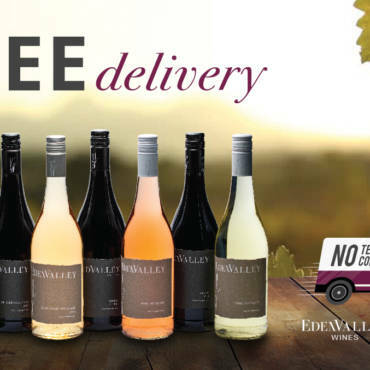 Once safely back on firm ground, you will be received by the ReedValley staff and escorted to our tasting venue. 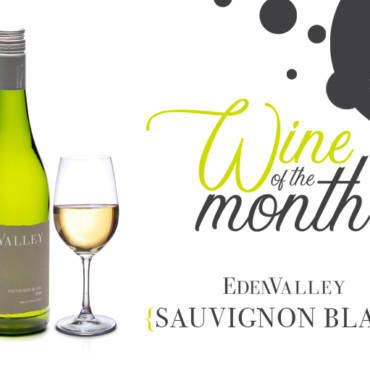 4) At our tasting venue you will take part in a wine tasting that showcases ReedValley’s export wine range. After the wine tasting you are welcome to order lunch from our menu. 5) A taxi will be available, if needed, to pick you up and drop you off anywhere in Mossel Bay – for a small additional fee. Friends and family are welcome to come and watch you land on the farm and join you for a wine tasting and lunch at our tasting room. Package price starts from R3960 and is costed per person. Subject to availability and schedule at the time of booking. The taxi service back to the departure point at Mossel Bay Airfield is R200 extra and not included in the package price. Book early to secure your place. 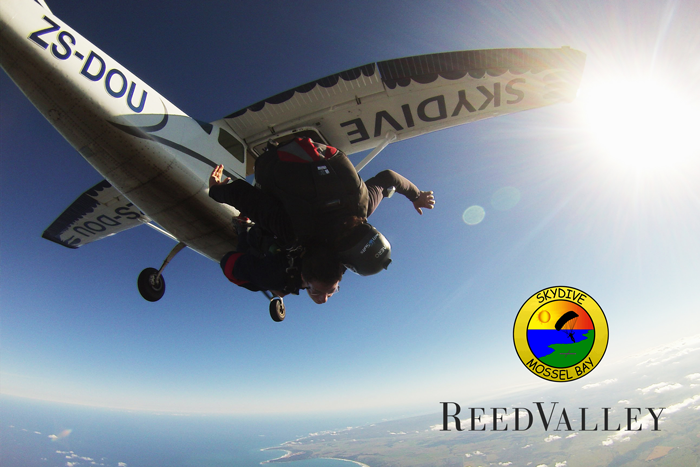 If you have family and friends joining you for your skydive why not have them enjoy a day out exploring the Mossel Bay area and then meet up with you at ReedValley to celebrate your adventure!